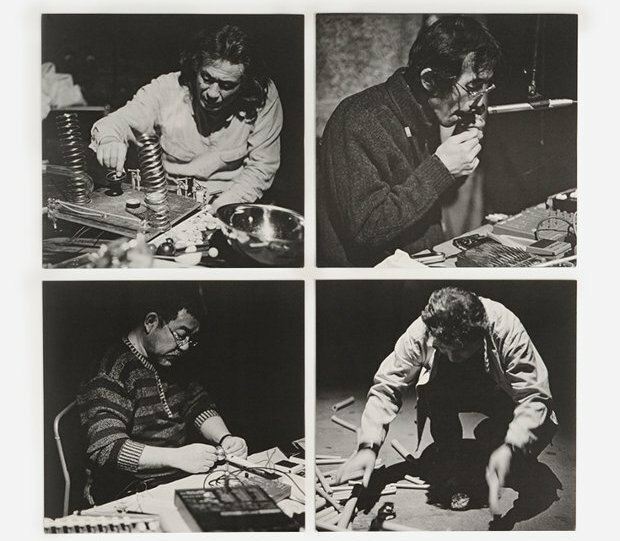 Marginal Consort is a Japanese collective improvisation group founded by members of East Bionic Symphonia, an outfit assembled from students of Fluxus artist Takehisa Kosugi’s class at the radical Bigaku school of aesthetics in Tokyo in the ‘70s. Meeting only once each year since their formation in 1996, Marginal Consort discuss nothing before their annual performances, preferring to gather as a collective of horizontally organized independent solos rather than a cohesive goal-oriented ensemble. The start and end times are the only fixed elements in their longform happenings, usually lasting two-to-four hours and featuring the players spread out across the performance space, distant enough to concentrate on perfecting their own work without distraction. Separate, yet together, they become entangled without subsumption into a whole, with the audience invited to mill about or recline on the floor, each creating their own subjective experience of the performance. Marginal Consort use established and homemade acoustic instruments, electronics, bamboo sticks, marbles, water, and other objects to realize their interpenetrating sonic constructs, but also incorporate actions that do not have sound production as their object. Current participants are former Taj-Mahal Traveller Kazuo Imai, engineer Kei Shii, artist and Gap member Masami Tada, and musician Tomonao Koshikawa. Their records together have been released by P.S.F. and PAN. Blank Forms, in cooperation with Black Editions, has organized two shows for Marginal Consort, who will make a rare break from their once-yearly concert tradition to convene in New York on June 1st and in Los Angeles on June 3rd. This project was made possible by the support of Arts Council Tokyo.